The Maine Arts Commission names its annual fellows, and Space Gallery funds a new round of Kindling projects. Two arts organizations have distributed $100,000 in grants to Maine artists. The Maine Arts Commission awarded $35,000 among seven artists as part of its Maine Artist Fellowship Awards program, and Space Gallery dispersed $65,000 to 14 artists and projects as part of its 2019 Kindling Fund cycle of grants. Maine Arts Fellowships recognize artistic excellence and are selected by out-of-state judges. Each winner received $5,000. 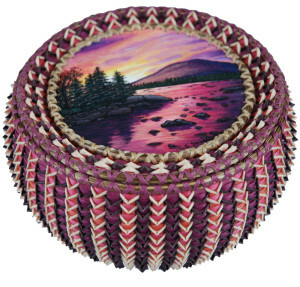 “Glowing Sunset” by Sarah Sockbeson, ash, sweetgrass, birchbark and acrylic paints. This year’s recipients are Diana Cherbuliez of Vinalhaven, visual arts; Jennifer Lunden of Portland, literary arts; Jan Owen of Belfast, craft arts; Sarah Sockbeson of Kingfield, traditional arts; Daniel Sonenberg of Portland, performing arts; Thomas Willey of Southwest Harbor, media arts; and Lynn Duryea of Deer Isle, Belvedere Handcraft award, for a craft artist in Hancock or Washington counties. In addition, the Maine Arts Commission announced participants in its Traditional Arts Apprenticeship, a year-long program that pairs masters and apprentices to sustain traditions and pass them down through generations. This year’s apprenticeship recipients are Jawad Al Fatlawi, master in Middle Eastern music, and Ghassan Al Hamdany, apprentice; Brian Theriault, master snowshoe maker, and Benjamin Latvis, apprentice; Atiya Haji and Khadija Ibrahim, master Somali Bantu basketmakers and textile artists, and Malyn Negye and Halima Mohamed, apprentices; Thomas Cote, master Acadian woodcarver, and Kennedy Bancivenga, apprentice; Jeffrey Allan Miller, master blacksmith, Hannes Dale Moll, apprentice. This is the fifth round of Kindling Fund grants administered by Space Gallery. The fund is one of 11 national regranting programs established by the Andy Warhol Foundation for the Visual Arts, which has given several large grants to the multimedia contemporary arts venue in Portland. This year’s recipients are Chris Battaglia; Adriane Herman; Isaac Jaegerman and New System Exhibitions members Franklin Ahrens, Henry Austin, Alice Jones and Hector Magaña, Cody Stack; Daniel Quintanilla and collaborator Shuab Ahmed Mahat; Derek Jackson; Devon Kelley-Yurdin and collaborator Nicole Em; Irina Skornyakova; Hope Rovelto; Jenny Brillhart and collaborator Goody B. Wiseman; Bianca Sturchio and collaborator Riel Sturchio; Galen Koch and collaborators Greta Rybus, Josie Holtzman and Isaac Kestenbaum; Alana Dao and collaborator meg willing; Caroline Losneck and collaborator Kelly Sue Rioux; Pat Corrigan and Apohadion Theatre members Greg Jamie and Jeremy Robinson. A panel of outside jurors considered 46 applications. Jurors were Myron Beasley, associate professor of American studies and Gender and Sexuality Studies committee member at Bates College; Abigail Satinsky, curator of the School of the Museum of Fine Arts at Tufts University; and Robert Blackson, director of exhibitions at Temple University’s Tyler School of Art and administrator of the Velocity Fund.